View and/or share your own photos of the show with us using our Google Photos account: https://goo.gl/photos/aqThCViRScxZMu689. This page features a handful of older photos leading up to the show. By submitting photos to our shared web site the person uploading the image(s) acknowledges that he/she is the originator of the image and grants WSS-NY 2016 and the APS full rights to use the images for their purposes without restriction. 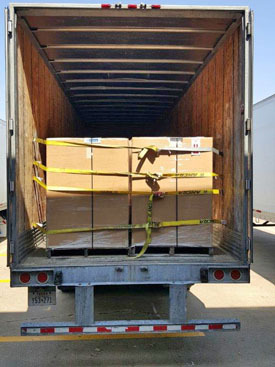 Here they are--the first load of exhibit frames heading to the warehouses in New York City. 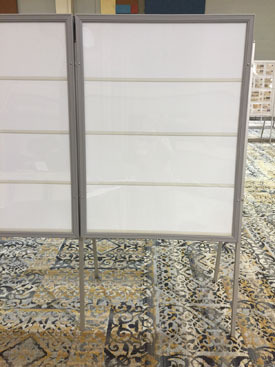 Tested first at TEXPEX as seen above, these light weight and super-strong frames will be available for purchase at the conclusion of World Stamp Show-NY 2016 in June. 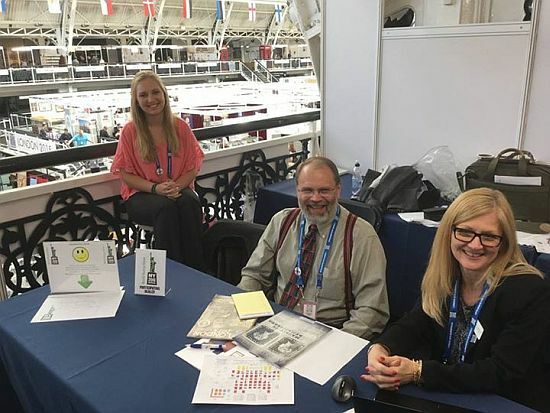 WSS-NY 2016 booth at London 2015 EUROPHILEX, May 14-18, 2015. Eric and Tami Jackson and their niece, Cheyenne Clark, are holding down the fort. 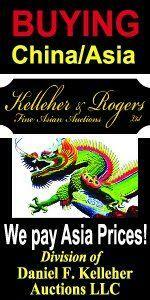 Thanks to APS and Jay Bigalke for the photo. 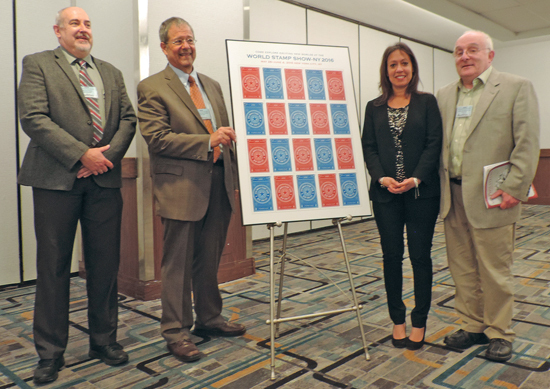 WSS-NY 2016 President Wade Saadi and Vice President Steven Rod are joined by American Stamp Dealers Association President Mark Reasoner and USPS official Wanda Santos at the unveiling of the Postal Services’ commemorative 2016 show sheetlet at the ASDA Spring Stamp Show in New York City on April 20, 2015. 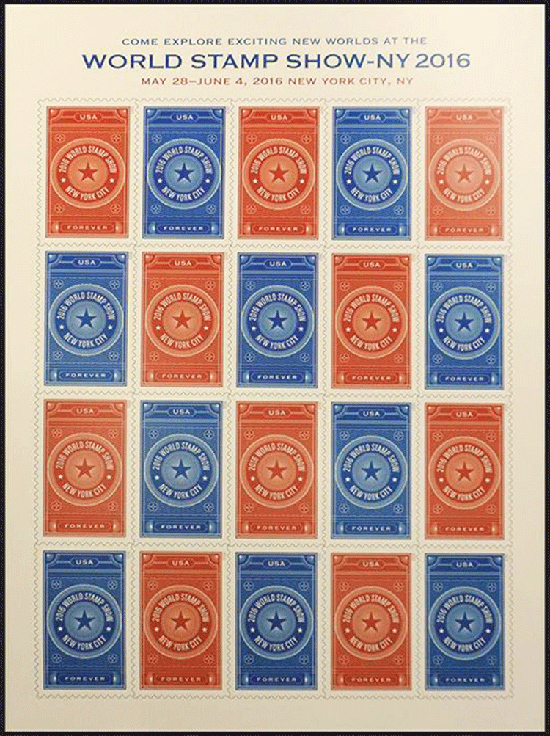 The “Forever” stamps will be released in August 2015 at StampShow in Grand Rapids, Michigan. 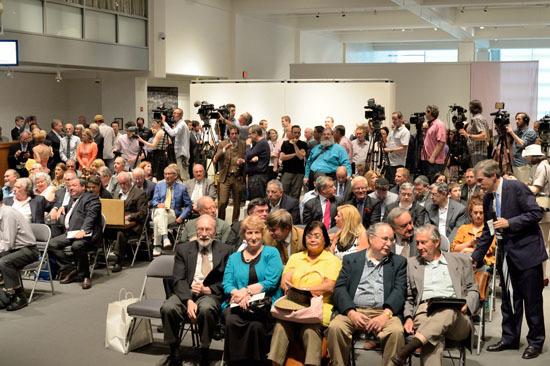 A capacity crowd in New York City that evening, including several WSS-NY 2016 officers and donors. 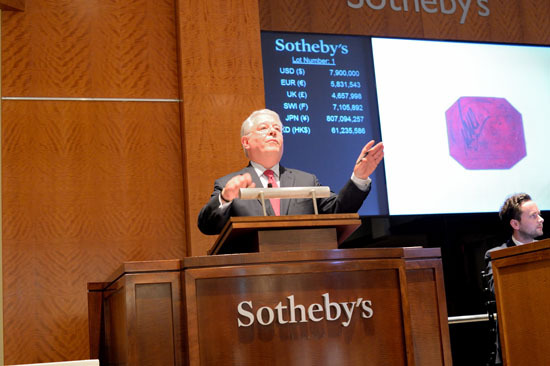 The hammer falls for a world record setting price. 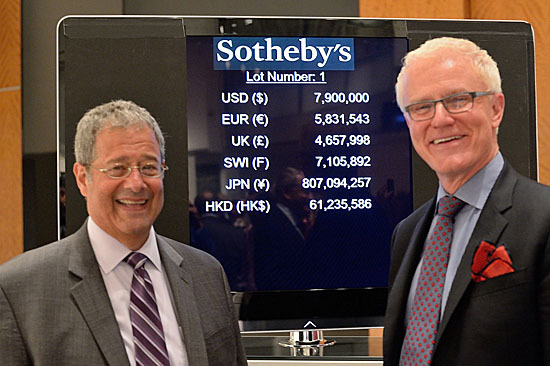 WSS-NY 2016 President Wade Saadi and Development Chairman Charles Shreve enjoying the historic occasion. 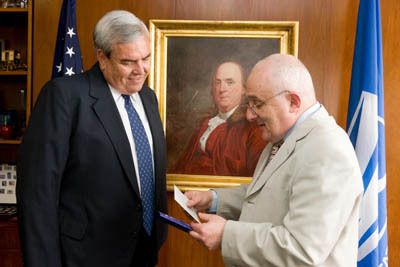 President of World Stamp Show-NY 2016, Wade Saadi (right), accepts a generous $25,000 donation check from Ed Jarvis (left), Chairman of the Board of WESTPEX, Inc., sponsors of the yearly WSP national stamp show held in San Francisco. 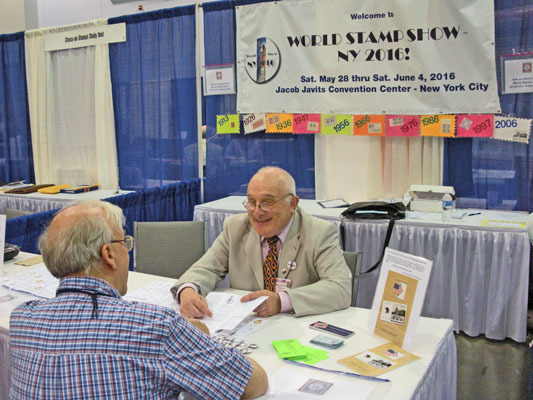 Steve Rod meets with APS Stampshow 2011 visitors in Columbus, OH at the World Stamp Show-NY 2016 booth in August. 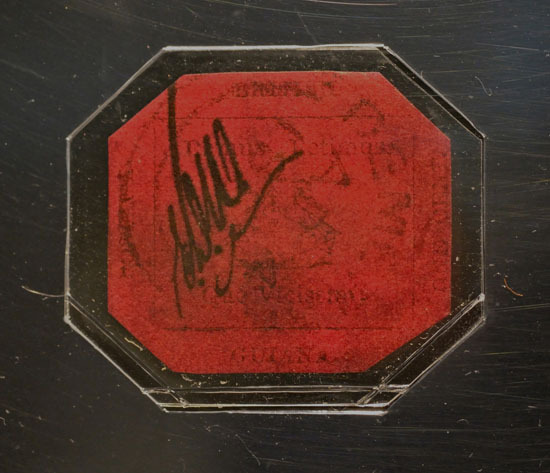 This was the first time memberships were available, here at the "Liberty Club" level. 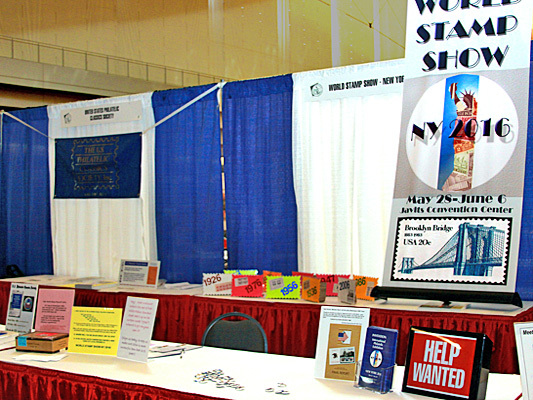 Our first show booth at APS Stampshow 2009 in Pittsburgh, PA.
Steve Rod, World Stamp Show-NY 2016's Vice-President and General Exhibition Chairman, meets with U.S. Postmaster General Potter in June, 2008. 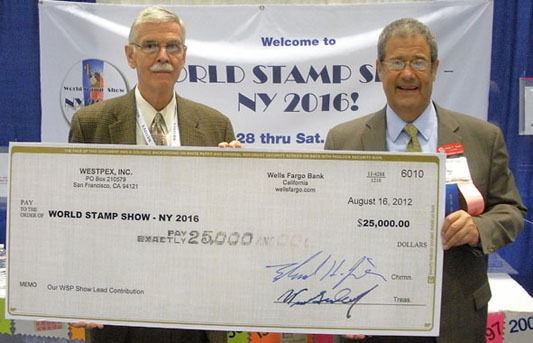 Rod is presenting him with a set of World Stamp Show- NY 2016 souvenirs.